Trout Lillies and Trouts Signal Spring! You are here: Home / Home Page / Trout Lillies and Trouts Signal Spring! I am a gardener and an angler. In the spring, these two passions vie for my attention simultaneously because gardens and trout streams wake up from winter at around the same moment. Just as warming ground stimulates seeds to germinate, bulbs to flower and trees to leaf out and bloom, warming activity on a trout stream causes insects to reproduce and fish to rise up from the cold stream bottom to feed. 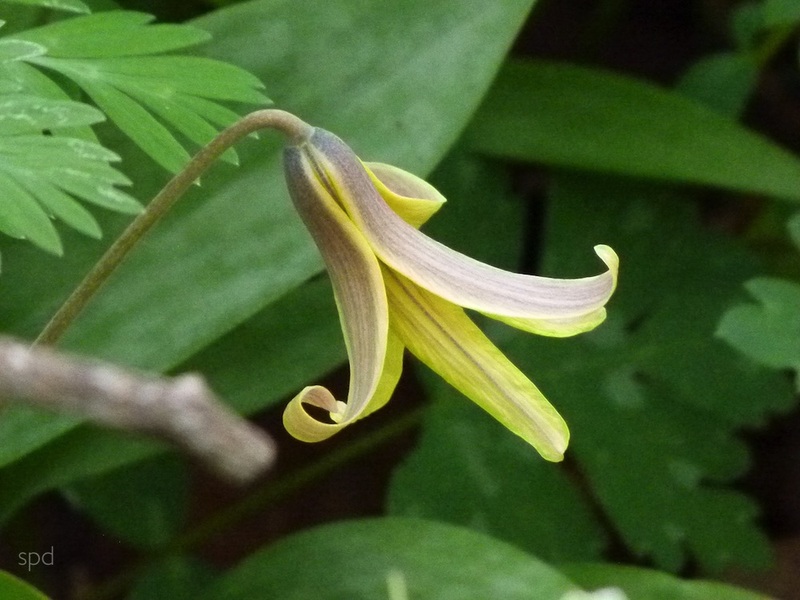 The connection between my trout stream in the Catoctins and my garden in the Maryland suburbs is the tiny Erythronium americanum or Trout Lily. This spring charmer and recent addition to my shade garden under a maple tree has been as exciting to observe as the first hatch on a stream in April. How can one resist loving a native plant whose bloom time was regarded by the Cherokee Indians as the time to fish for trout? Or who’s 2 to 3 inch, lance- like veined and mottled foliage so closely resembles a speckled brown? Moreover, the Trout Lily is a “spring ephemeral”, a wild flower that appears very early in the year, then blooms and fades away before summer, and every angler has experienced a day of fishing when trout appear in a morning flush only to vanish for the rest of the day. I started my colony of Trout Lilies with an order from Eastern Plant Specialties. This marvelous catalogue specializes in native plants, wildflowers, ferns, and scented deciduous azaleas. 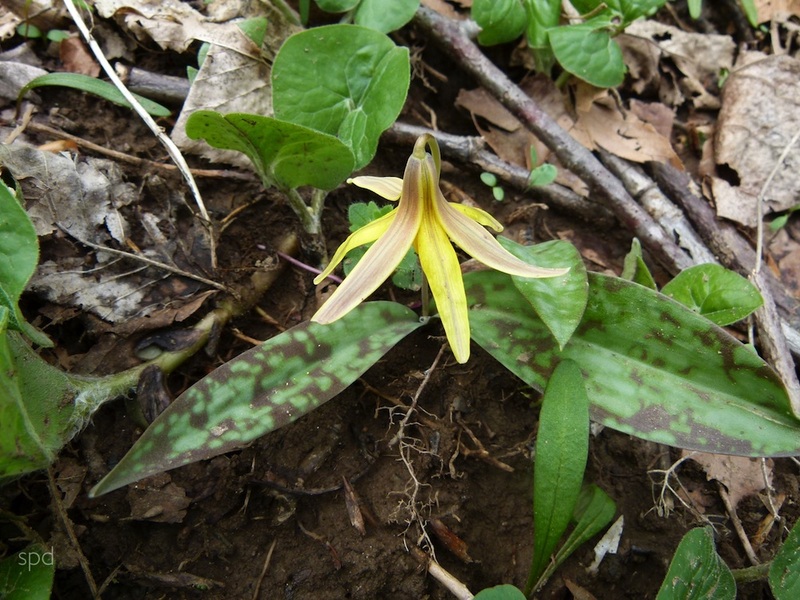 The Trout Lily bulb is small and insignificant and the plant grows from a deep rootstock 3-5 inches underground. It creates colonies by spreading shoots from the corm. “Jaunty attitude” of the Trout lily in afternoon sun. The charm of the Trout Lily for me is not only in its connection to trout fishing, but also in it’s delightful yellow lily flower. The petals are entirely yellow, opening in the morning and closing at night. On bright days the petals curve backwards giving the plant a jaunty attitude. The colonies bloom at the same time as Spring Beauty, (Claytonia virginica), and make handsome companions in the earliest months of the woodland garden. A VNPS Member who studies the landscape in Flint Hill, VA on weekends! Editor’s Note: Although Eastern Plant Specialties is no long operational, Trout lily is still available from numerous online resources. Also spring is a great time to check out the local native nurseries and plant sales; our own sales list for 2016 will be updated this week.